School starts tomorrow afternoon (there is only a half day tomorrow), the day after Labor Day. So we labored all day to be ready for our big feast tonight. Kindness begins with me.' 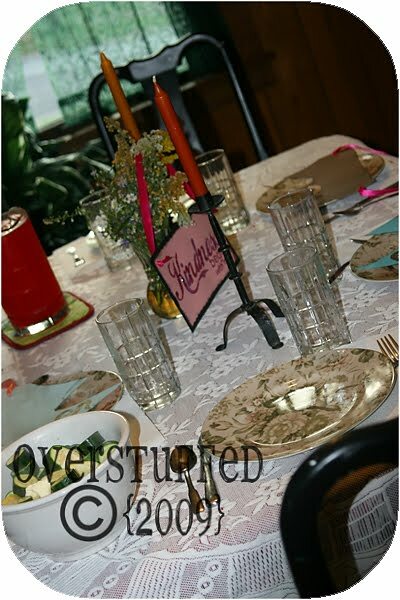 "
We used the best dishes and the best tablecloth (none of which are all that great), and ate by candlelight. We had a lovely vase of wildflowers that Chloe picked the other day. We still had to use paper towels, though, because I couldn't find my nice napkins. Maybe I haven't unpacked them yet. Hmmm. I made the girls their crowns only about 5 minutes before dinner. So, they're not the cutest, but they still loved them. 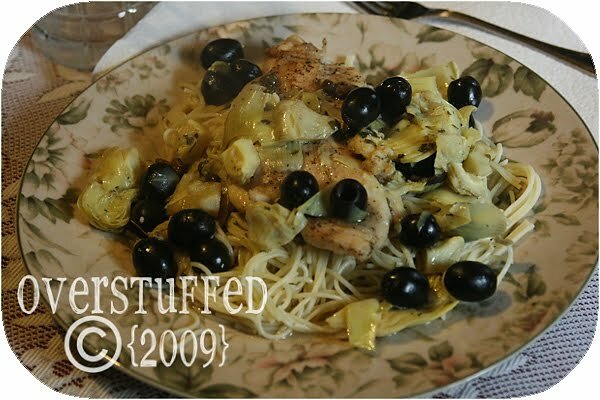 Daddy made a delicious meal of pasta with chicken, artichoke hearts, capers and olives. We had steamed squash on the side. Yummiola! 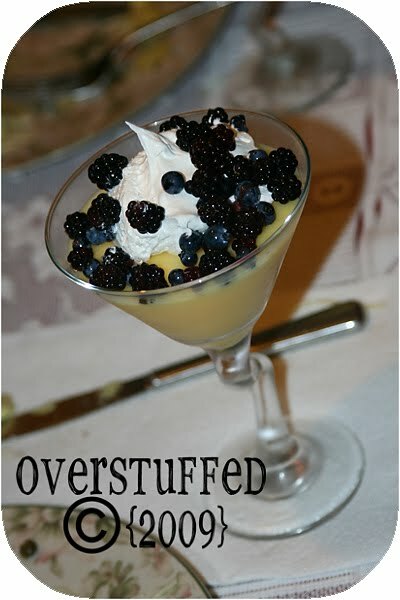 For dessert, we ate vanilla pudding with whipped cream and fresh berries. The girls and I picked the wild blueberries and blackberries the other day. I am going to love living here knowing I can do stuff like that all the time! After dinner, the girls modeled their first day of school outfits for us (no, they didn't get to eat in them). I'm not going to show you pictures because that would ruin their first day of school pictures! After the fashion show, Joel gave them their Father's blessings for the beginning of the school year. I always look forward to these, and I hope the girls do, too. Wonderful evening. Let's hope the school year is just as great. What a cool idea! And you guys are fancy! I'm totally jealous of your wild blueberries and blackberries - Pueblo Colorado is NOT the mecca for brambles (but it is for spicy chile peppers and cantaloupe!). And, don't you just love back to school Father's blessings? It's one of my favorite things. How fun. I'll have to think of a boy version of this for my son next year, but I'm always up for new traditions. What a cool idea . . . that my kids will probably never get . . .
What a sweet way to start the year! My little one is only a year old, so school is a way off, but I'm tucking this idea away for when that day comes. Thanks! You are so awesome! I LOVE it! What a great idea! And, I love the theme too. What a fabulous idea! Your girls are darling. Good luck at the new school. You should link this post to Carolyns tablescaping thursday one. Your table is so cute and the food looks great. I miss picking berries from the wilds of Alaska, and that is quite a perk for your new home. Sounds like a great day! Wonderful! You do so many great things, Oh--I must have that pasta recipe, if you please! Amanda B. Beautiful Lara! I saw this on Stephanie's blog and thought it was a great idea then..even better now! And P.S- love the buckets idea in the girls bathrooms. Very creative! I've been thinking about doing this, too, but this year I didn't. Yours turned out so well! I may have to try next year. So neat to make school such a special experience. We did a special breakfast followed by blessings. What a great idea! Hopefully I'll remember to do something like that next year. What a wonderful tradition! I am always looking for more of those! 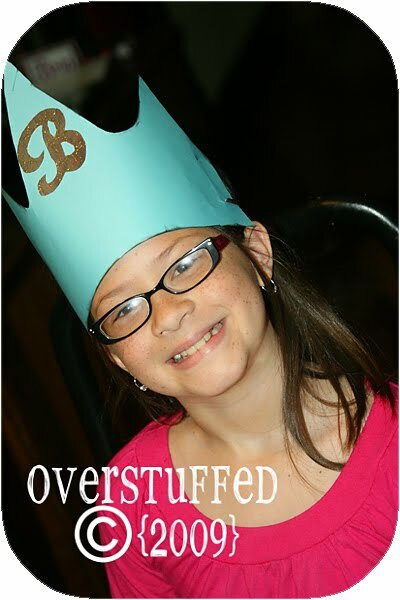 I love the crowns and yummy food! Wild berries so jealous! I might be able to find an old cactus needle somewhere around here! That's a fun idea! I could even incorporate it into my homeschooling kids! I'll have to remember it for next year. The blackberry/blueberry topping looks delicious. We have some blackberry bushes down the street that we've been collecting from this summer. Always a yummy treat! Sounds like a fantastic tradition! Best of luck to all of you starting your brand new adventure! Great idea Lara! I bet they are soooo exicted. Can't wait to see the pictures! They all have darling smiles!! 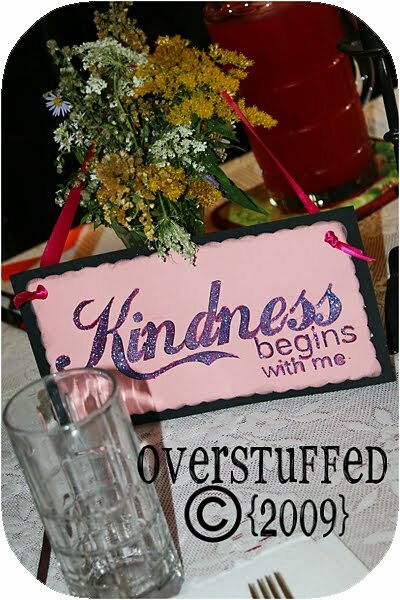 I love that you did a theme along with the feast---and I love that it's kindness. What a great idea! Great idea. Well executed and the girls look like they had a great time! what a great tradition! i hope i get to do this someday. Turned out beautifully Ms. Lara. You are a genius. It's really a great idea, but I think it may get lost on my little princes, they don't tend to care about stuff like fancy dishes, etc. I am so far behing on reading blogs and blogging myself. I decided to take today read all the posts I have missed and catch up a bit. Nie Nie had it right with this idea. I bet all kids would just love this. Maybe if we are a little more settled next year or at lesat living in our own place I might do this. Can you believe your baby is big enough for pre-school? I can't. I decided to keep Emie home with me one more year. I may be doing her a disservice but I want my baby to be my baby one more year. Especially with the possibility she might be my last one. What a darling way to go back to school! Isn't it great when you make such a fuss about it? It's a one time thing that carries through for weeks! 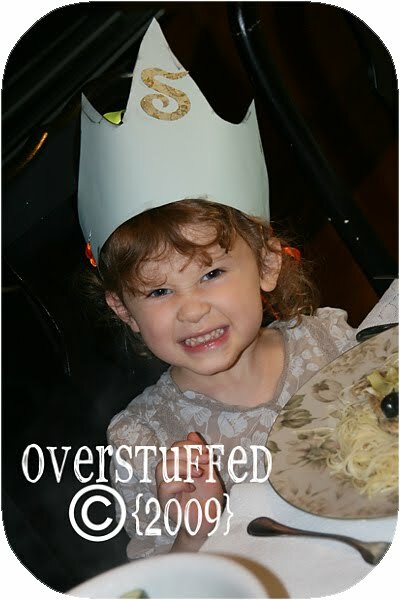 Love the crowns and it's so nice to see your lovely dishes being used and enjoyed. What a great idea, I hope you don't have a copy right on that. What a great idea! It's so fun to make your own fancy occasions—I bet your girls will remember this forever, and even pass it on to their own kids. I bet your girls just loved it. What a way to kick off the new year. Good luck to everyone. What a special dinner! 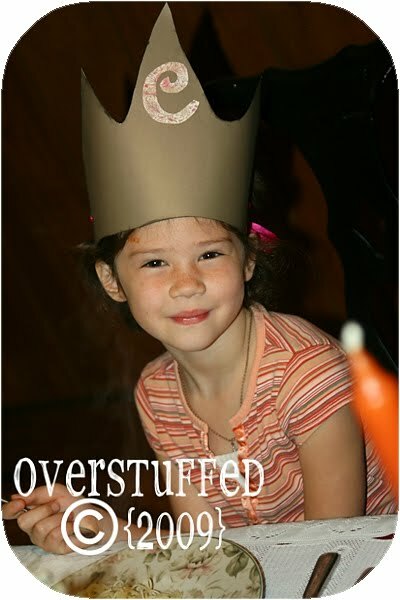 And cute crowns too. I hope they had a wonderful day today at school. I have always thought that was a cool idea. Great for you to adopt it too, especially this year with all of the newness. Good luck to your little beauties! That candlelight dinner and theme are the smartest things I've ever seen. I think I'll have to copy you. I thought the crowns turned out cute! Awesome idea. I think most nights before the start of school for us consist of me screaming at the kids to hurry up and go to bed, and "Do you know what you're going to wear tomorrow? Have you packed your back backpack yet? Why are you still awake??!!" I'll have to remember that kindness begins with me.